Need somewhere to store all your dog's toys? Look no further! Our luxury dog toy bags are all handmade to order for us and they can even be personalised with your dog's name so there will be no confusion as to who's toys are who's! These dog toy bags have a drawstring closure and they are perfect for storing everything your dog needs for a sleepover at a friends. Need a safe place to store your dogs toy? If you have guests coming around then you may not want all your dogs toys scattered around the room and buried in various crevasses so it’s time for you to buy a lovely dog toy bag. 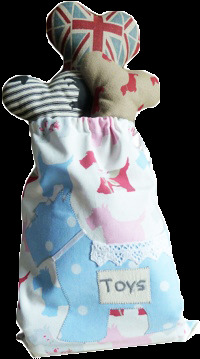 At Chelsea Dogs, our dog toy bags are exclusively handmade to order for us here in the UK by the wonderful Penny Belle. Choose from fun Scottie Dog prints and even have your dog’s name embroidered on the bag. If you would like your toy bag for dogs made in a different fabric that you don’t see on our site then please pop us an email and we’ll do out best to accommodate your request.